In May we supported pupils from the Friedrich-v. Bodelschwingh-School Bethel. They aimed to learn something about biotechnolgy with the topic "Biotechnologie in unserem Leben" (Biotechnology in our life). Therefore they did some experiments in the Center for Biotechnology in Bielefeld which was guided by our team. 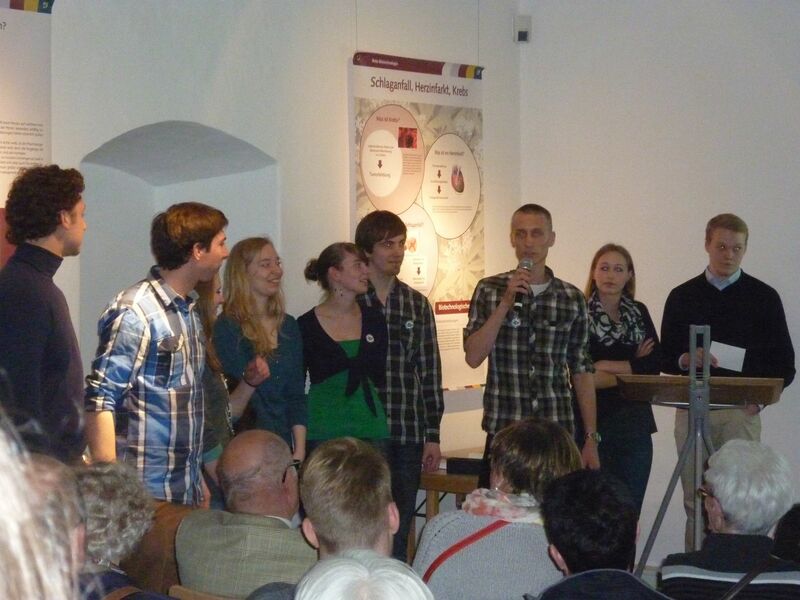 At the opening event we hold a presentation about the iGEM competition and in particular about synthetic biology. fig. 2: Boas Pucker is presenting our team and our project to parents and visitors. fig. 1: Our team is presenting our project at a poster. The pupils learned a lot about biotechnology and had much fun. About all their experiments they made a film clip to present it to their parents at an exhibition in the natural history museum (namu) in Bielefeld. The namu engages in different aspects like nature, human and environment. The collection of exhibits consists of more than 500.000 objects. The museum also engages in new projects like for example the exhibition "Biotechnologie in unserem Leben". It was the first time for the museum to do cooperation with the Friedrich-v. Bodelschwingh-School but they already said that they would repeat such events. After the presentation of the film clip and a brief talk about our team and our project the pupils presented their posters about different kinds of biotechnology like green, blue or red biotechnology. 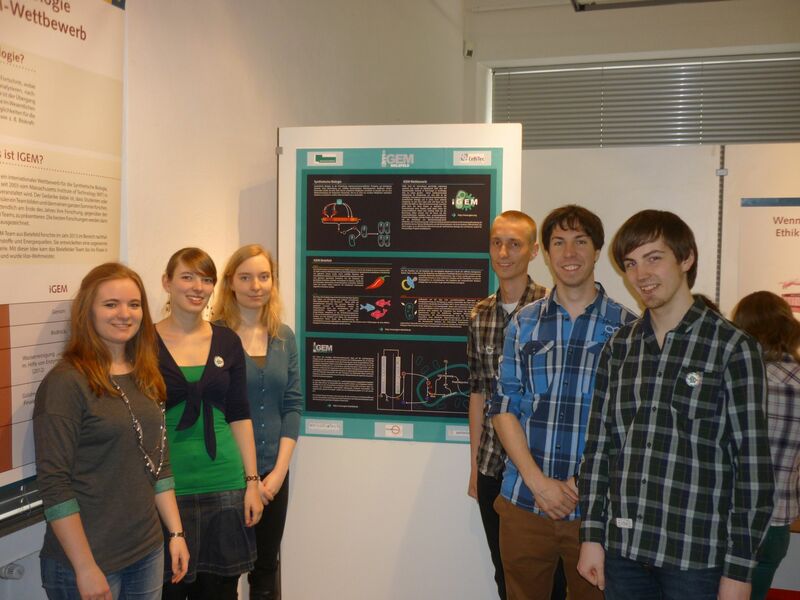 We had also designed a poster to present synthetic biology, the iGEM competition and the history of iGEM Bielefeld. We used the chance to explain the project of our team to many interested parents and visitors of the Namu exhibition in detail. We hope that everyone learned a lot and will follow our project presentation in Boston.